Remember horror movies in the 80’s? It was a time where you didn’t have to watch the SyFy Channel to see something ridiculous like a tornado spewing sharks around Los Angeles. 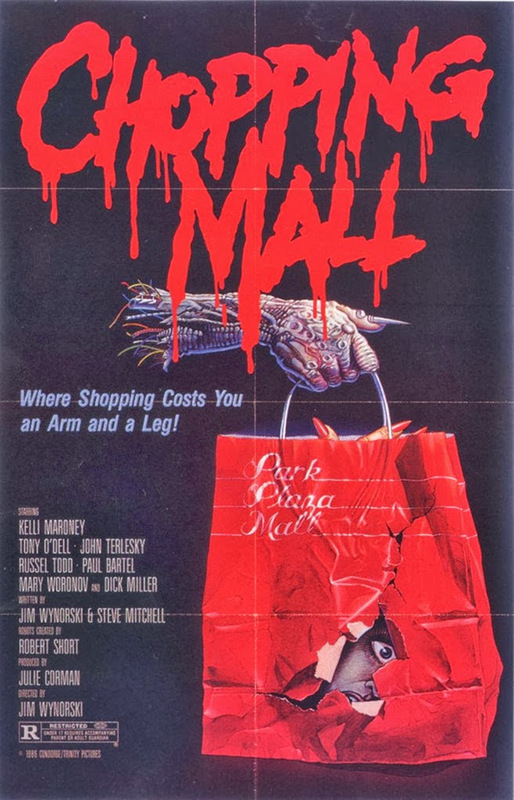 It was a time where you could have a movie named Chopping Mall that involved killer robots shooting lasers at a bunch of kids having a sleepover in a mall. And it was a time where you were pretty guaranteed to see Barbara Crampton’s breasts in every movie that she was in. Bottom line: I absolutely love Chopping Mall. And it was the poster and VHS box cover art that sparked it all off for me. Hahaha! ‘Where Shopping Costs You An Arm And A Leg!‘ Get it? To me, this poster and movie is the epitome of 80’s cheesy horror movies. It’s high up on the pedestal, the ladder, and the totem poll. If you haven’t seen Chopping Mall (a.k.a Killbots), you must. And if you’ve seen it and have always dreamed of seeing up on the big screen, I have good news! Director Jim Wynorski has announced that he and others involved with the cult classic are trying to get screenings across the US going on ASAP. And if there’s a horror movie that needs to be seen on the big screen with a bunch of drunk and stoned people, it’s Chopping Mall. How about getting a special edition Blu-ray while we’re at it? Stay tuned for more info on the screenings and go grab Chopping Mall on DVD for now to get your cheesy horror fix and see one of the best exploding head scenes ever.